Wojciech Smarzowski’s film is a much needed voice in a the discussion concerning the Catholic Church. But is it powerful enough to shake the grounds causing visible changes? Have you heard about a film that has challenged the entire Institution of Church to speak openly about its sins? If not, then you should. Because it is the most important Polish film in years. This film has already brought more than 2,5 million of viewers in only two weeks. It’s a groundbreaking result for the Polish cinemas and it’s headed for setting an all-time record. This film is “Clergy”, directed by Wojciech Smarzowski. The story cruelly unmasks the hideous lies and crimes living inside the Polish Catholic Church. The film follows three priests, who manage various parishes. They all contradict the very values that the Church theoretically cherishes. While fighting the demons of their own pasts, their fallible nature breeds new generations of rotten members of the community. Rarely does it happen that a film stirs the pot so much that – apart from crushing the box office – it also brings a significant topic to the table. But “Clergy” does precisely that – it causes people to talk. It’s not unusual for Smarzowski to bring such heavy artillery to the screen. Honestly, I always leave the screenings of Smarzowski’s film with the urgent need of a vodka shot. Or a shower, to wash off all of the dirt I have watched. He has shown the dismal situation of the police forces in “Drogówka”, presented the harsh existence in the rural, poor villages in “Dom zły” and looked at the terrible problem of widespread alcoholism in “Pod Mocnym Aniołem”. All of the above were heavy and unforgettable. Wojciech Smarzowski, the director of “Clergy”. But his true directorial grit was most apparent to me in “Wołyn” from 2016. The massacre that took place prior to the outbreak of the World War II was a bone of contention between the Poles and the Ukrainians for decades. In “Wołyn”, Wojciech Smarzowski proved that both sides were equally responsible for the bloodshed. The film was a shocking experience – a vast pool of soul-shattering images of hatred, death and pain. He handled an extremely difficult topic in a very confident manner. Notwithstanding the artistry and importance of all of these films, none of them was such an earthquake for the Polish society as “Clergy”. In a country, where more than 90% of citizens officially belong to the Catholic Church community (the percentage of the “practitioners” is a different story), a flat-out criticism of that institution is rather risky. A good portion of Poles rejected to even talk about the movie, some went as far as boycotting it and calling it false – even before the film had any viewing. Then, there was the other side of the fence. An event was organized on Facebook with thousands of people supporting the film to make it speak louder. “Clergy” has been divisive without a single screening. Not many have achieved that. While Poland is becoming more closed-off and self-contained politically, this film is bold and open about “the state of the state“. The film often switches its focus in order to paint a broad panorama of the Church as an organization. But underneath it is a much broader perspective. A picture of a country, which desperately holds onto a formidable lie of Church’s purity. A country, which cannot erase its connections with this particular organization. The picture is appalling. The people wearing cassocks are knee-deep in dirty dealings. Bounded by celibacy, they are regulars in brothels or – as the subplot with Robert Więckiewicz depicts – they form secret relationships. There is money pumped into shady investments, lobbying and all kind of despicable matters that Smarzowski exposes without hesitation. But “Clergy” is not a film, which succumbs to fingerpointing and noisy comments. Smarzowski paints a complex sketch for each of the characters. 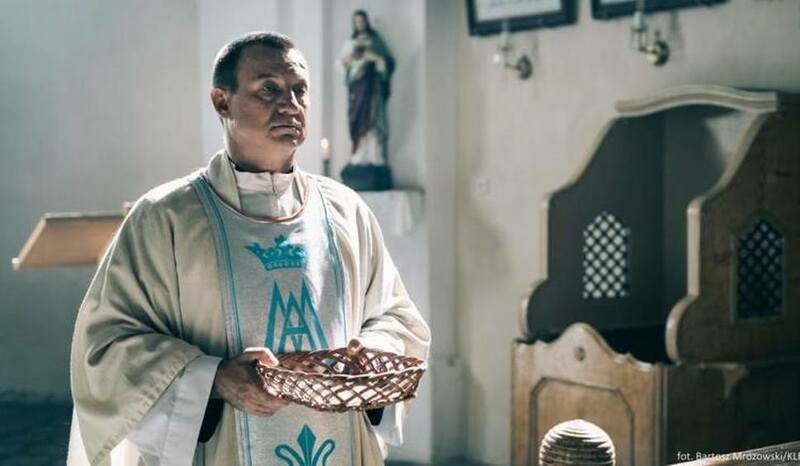 One of the priests called father Kukuła – righteously accused of child molestation – runs away from a social lynch, just to embark on a self-cleansing journey. 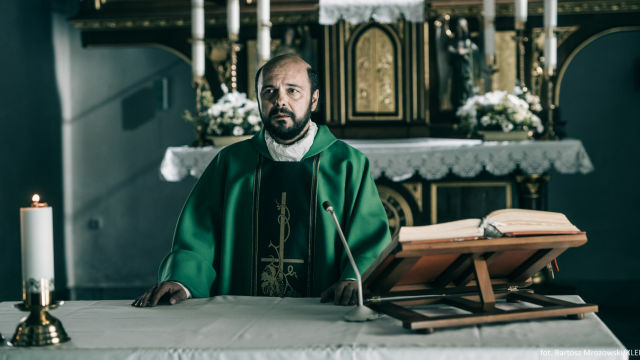 He digs deep into his own painful memories, which all lead to a devastating scene where father Kukuła faces his own demon of the past – the priest, who raped him too. 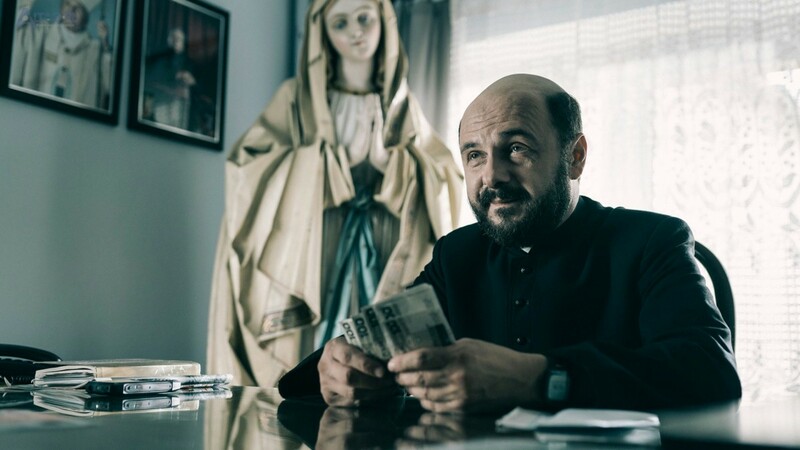 Arkadiusz Jakubik as Father Kukuła in “Clergy”. The truth that is hard to process is that this unspeakable evil has been breeding in Church for years. Generation after generation has been spoiling the one institution that was supposed to be giving people a higher meaning in their lives. The pivotal role of the Church as the people’s aid in the post-war Poland has also made things harder nowadays. Church has been helping people, it fought against the communist government. People were united under the symbol of cross. Hence it makes sense that a priest used to be automatically regarded to as a better man, a leader. In the end, priests are called by the God himself to serve him well. It’s almost as if becoming one makes his soul cleansed and free of sin. But obviously, it’s an old-fashioned (if not narrow-minded) way of thinking. To some degree, it was built by the context, the circumstances. When Church took the weight of steering people, it has gained a lot. The truth is that priests are regular people, with all the flaws included. Not many of them can live up to the high expectations. Furthermore, the country cannot easily deprave the Church of its power. Years have past and Church is still an incredibly resourceful, influential organization in Poland. It’s a propaganda tool in the wrong hands – a powerful one too. That’s also what Smarzowski mentions in “Clergy”. The intricate mechanisms of delegating responsibility and gaining power through a neverending network, spread across the whole country, is both astonishing and frightening. While I focused on the less cinematic aspect of “Clergy”, I can’t forget how good it is in these terms too. All of the three clergymen – played by Arkadiusz Jakubik, Jacek Braciak and Robert Więckiewicz – are believable, understandable characters. Observing the three actors is as deeply frustrating as it is rewarding. It’s a feast. Their stories are entwined to create a complex view of the problem. While Smarzowski has been widely known for his affection for going extreme with graphic imagery – like a scene with a boy burned alive in “Wołyn” – he deploys more subtle ways to crawl under the skin of the viewer in “Clergy”. A viewer doesn’t need to witness these atrocities, because imagination does the job well enough. 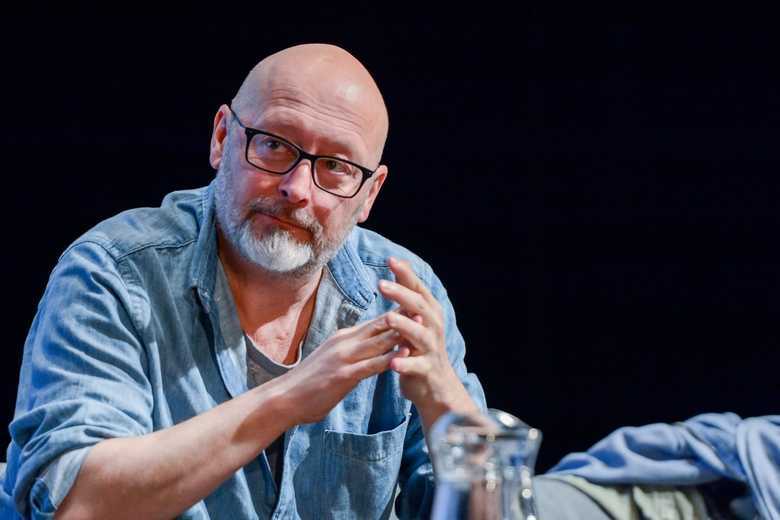 In an interview with Arkadiusz Jakubik I saw over the weekend, the actor voiced his belief that the film will be a wave that changes things. I cannot judge myself if “Clergy” is capable of such a powerful outcome. In the end, people who watch the film are mostly not the ones in power to implement these changes. It’s a scarce chance, but nonetheless worth taking. The more we expose the world to the dirt that was swept under the rag for decades, the higher the probability of actually making a difference.